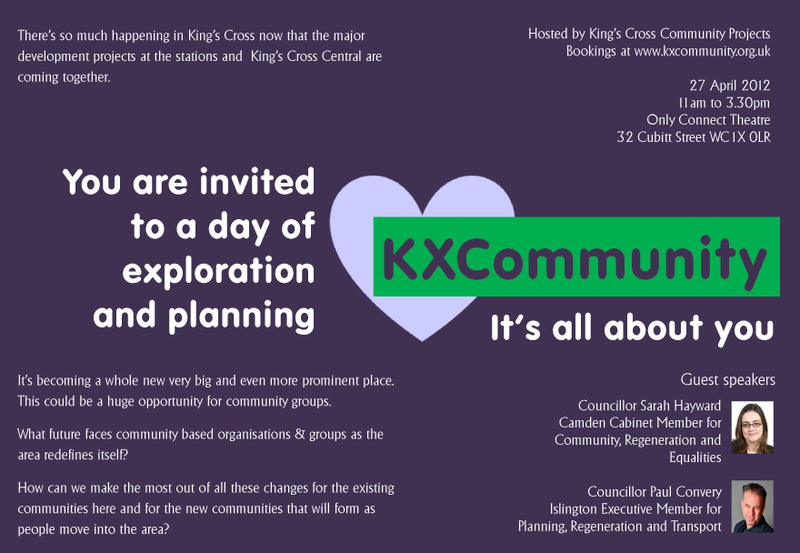 KXCommunity: It’s all about you is a day of exploration and planning for all community groups within a half mile radius of the perimeter of KX Station. 11am to 3.30pm, 27 April at the Only Connect Theatre. Cllr Paul Convery and Cllr Sarah Hayward will be there as our guest speakers. Places are limited, so do book early here to avoid disappointment! Depending on numbers we may have to ration the number of places per organisation or group, we’ll let you know if that turns out to be the case. For now your service users, volunteers, staff, management committee and trustees if you have them are invited. Oh, and it’s free for community groups thanks to a donation from the staff at E C Harris on York Way. This entry was posted in Community groups, Noticeboard and tagged Charities, Community, E C Harris, King's Cross Community Projects, Local groups. Bookmark the permalink.